Whether you are simply short on cash this month, or facing some other type of financial challenge that can’t wait, Illinois Title Loans, Inc. is here to help. With our Springfield title loans you may receive anywhere from $100 up to $4,000 in fast emergency cash. All you have to do to get started is fill out our short online request form, which you can find right on this page. 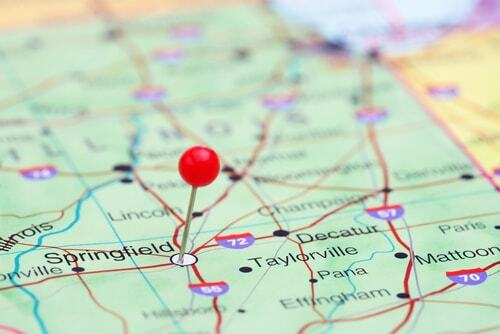 We are conveniently located at 410 North Dirksen Parkway in Springfield, Illinois, where you can find half a block south of E. Carpenter St. and about a quarter mile north of Freddy's Frozen Custard & Steakburgers. Upon arriving at the store, an associate will have your paperwork ready to go, helping you fill it out while a manager performs a quick inspection of your vehicle. After everything is done, you could receive cash amounts up to $4,000, regardless of your credit history. You even keep and drive your vehicle while repaying your loan. Get started now by filling out our short online request form and let Illinois Title Loans, Inc. help you out with your emergency cash needs today! We proudly serve residents of the greater metropolitan area, from Springfield to Chatham, and Taylorville to Jacksonville. Regardless of what your credit history looks like, you could get up to $4,000. The fast cash you've been looking for is waiting at Illinois Title Loans, Inc.! Why Choose Us for Your Springfield Title Loan?